DAVID PEVEAR, Sun Staff LOWELL – The view is impressive from the Thomas R. Machado Memorial Practice Field on the cleat-clawed hill behind Cawley Stadium. All that green grandeur you see before you is Lowell High School’s to play on. Rising in the distance are the wooden light poles of Stoklosa/Alumni Field, a professional baseball facility as recently as 1997 when the Lowell Spinners, the short-season Class A affiliate of the Boston Red Sox, played there a second season before moving downtown to LeLacheur Park. Regal in the foreground is the concrete edifice of Cawley Stadium, a Works Progress Administration project that first opened in 1941 and was brought back from decay in 1997 by a $1.7 million restoration project. The stadium in which the Boston Cannons of Major League Lacrosse wore out the grass the past three summers still echoes with the roar of 8,000 strong from Lowell High’s football glory days under coach Ray Riddick.To your right as you stand facing Cawley from the football practice field are shiny new silver bleachers towering over James S. Martin Field in preparation for the New England Riptide, the local entry in the National Pro Fastpitch League, in which 96 of the best women’s softball players in the country play.”When you looked at it from a distance when they first started putting the bleachers up, it looked like the field was surrounded by a roller-coaster,” says Lowell High softball coach Rick O’Brien with a chuckle. Reaping the benefits of the city’s eager forays into professional sports are the kids of Lowell High School. The seven fields of the Martin-Alumni Athletic Complex nearly every inch covered by lights and irrigation are first and foremost Lowell High’s to play on (per conditions set down by the donators of the property and by handshake understandings with the city).”The kids actually didn’t get much benefit from the Cannons playing here, because the Cannons wrecked the field,” says Lowell High athletic director Charlie Ryan. 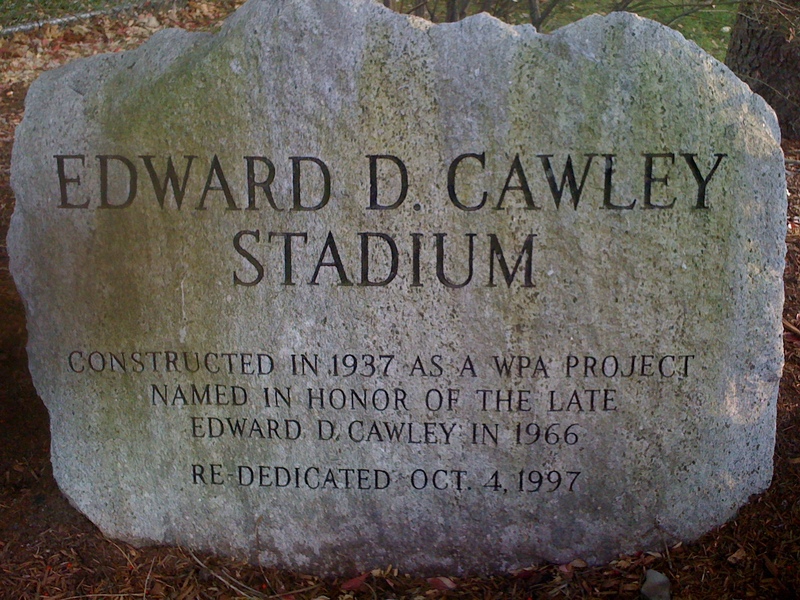 “The field as it is (inside Cawley Stadium) is a safety concern. We need to have it pristine because it’s the flagship of our facilities.”But overall,” adds Ryan, “our facilities are second to none; not only for Massachusetts, but for all of the Northeast. The (Massachusetts Interscholastic Athletic Association) uses our facilities for tournaments in just about every sport in the fall and spring.”Other than a reduction in the seating and a gradual erosion of the infield that causes an occasional bad hop off the lip, Stoklosa-Alumni Field looks essentially the same as when it was spruced up so that the likes of Shea Hillenbrand and David Eckstein could safely field grounders there. 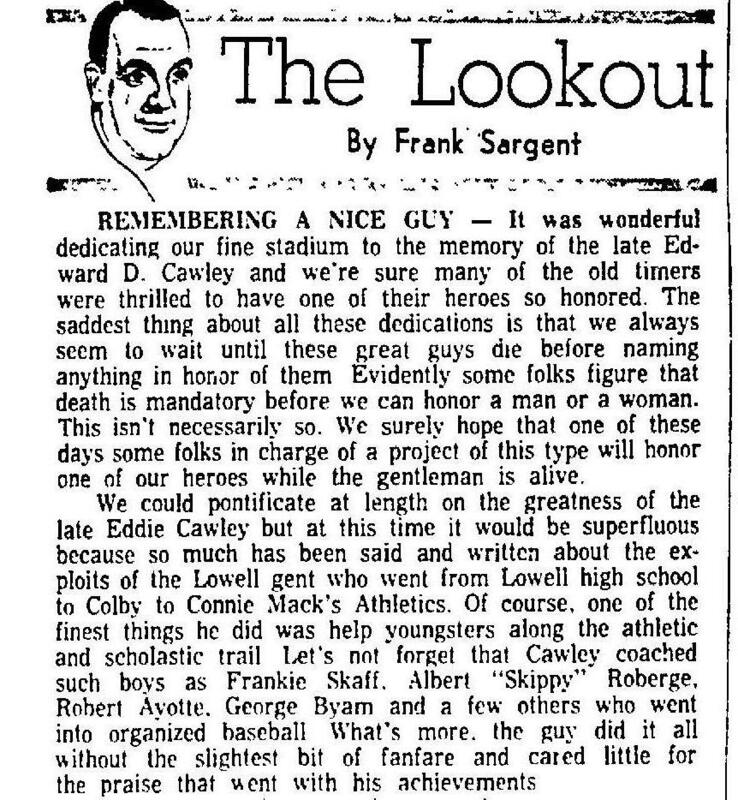 Lowell coach George Cunha believes the field named after his legendary predecessor as LHS coach, Stanley Stoklosa is the best high-school baseball facility in Massachusetts. He has pictures to prove it. “A few years ago we entered it into a contest for the top high-school field in the country,” says Cunha. “We took all kinds of pictures and sent them in. This field was judged the top field in the (Northeast) Region (based on the photos) and second or third in the country. The field that won, I think was from Minnesota. 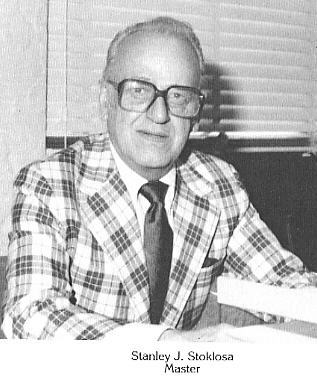 They went up in a plane and took pictures.”The plaque from the National High School Baseball Coaches Association contest to which Cunha refers is hanging in the small cluttered office of Paul Landry, the Martin-Alumni Complex’s chief groundskeeper. 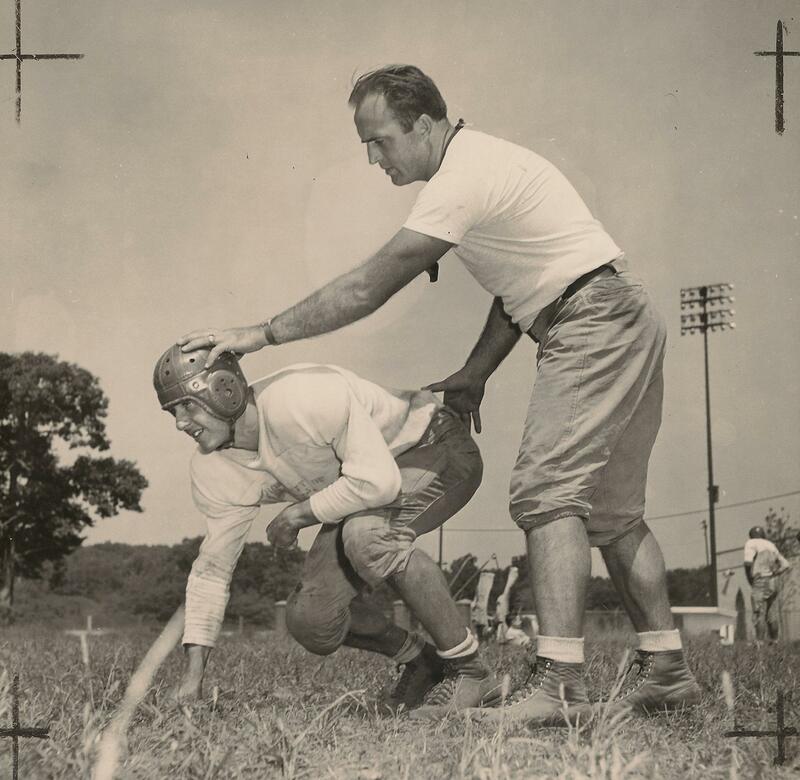 Landry traveled to Tulsa, Okla., in 1998 to collect the award, carrying with him sunnier pictures that he snapped of Stoklosa-Alumni Field.”The pictures that were sent in for the contest showed the mound when it was raining out,” he says. “You don’t do that.”Unfortunately the judges for the national award were already meeting when Landry arrived with his pictures. 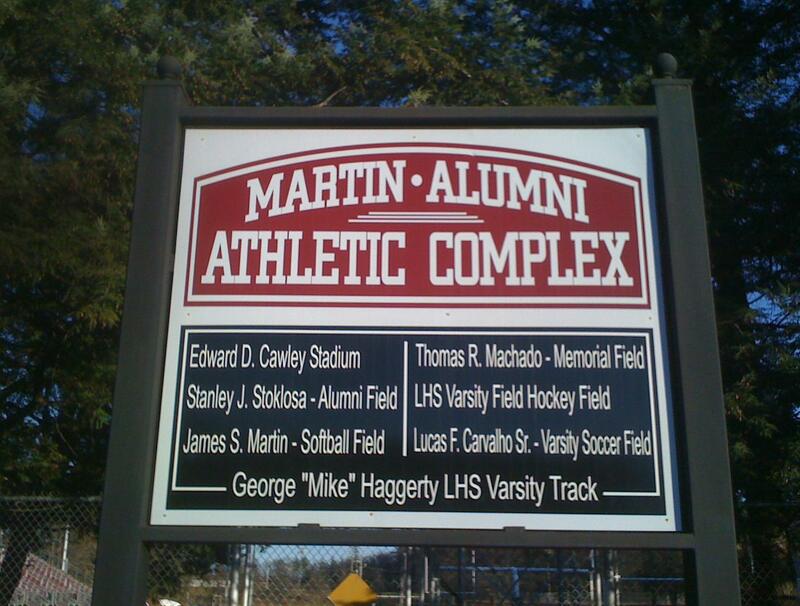 “We were too late,” he says.As impressive as Stoklosa-Alumni Field is as a high-school baseball facility, Cawley Stadium, where Lowell High has played football for 62 seasons, remains the enchanting centerpiece of the Martin-Alumni Athletic Complex. With the Cannons having moved to Boston University’s Nickerson Field, the grass may this summer have a chance to thicken into glorious green for football season. 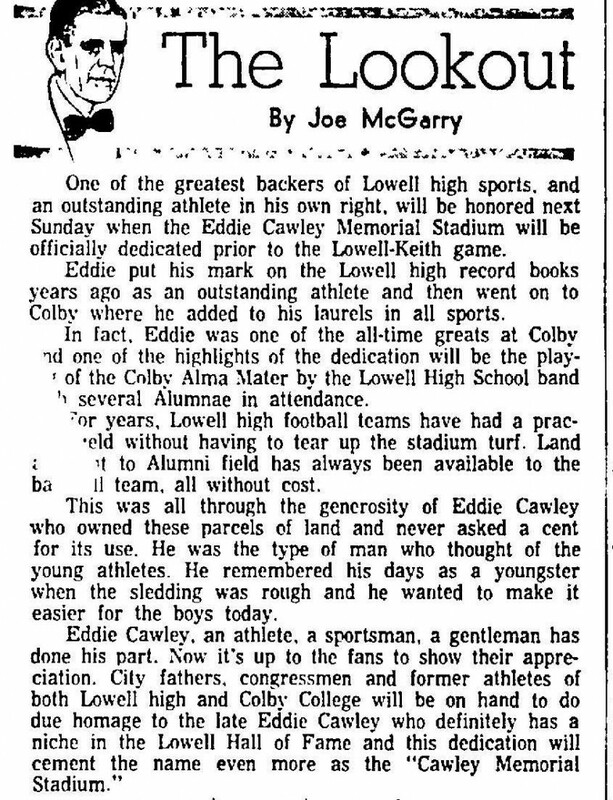 Right now it is struggling.”When you pull up to Cawley on a game night, it doesn’t feel like your average high-school stadium,” says Lowell High football coach Scott Boyle. “It feels like you’re at an event. 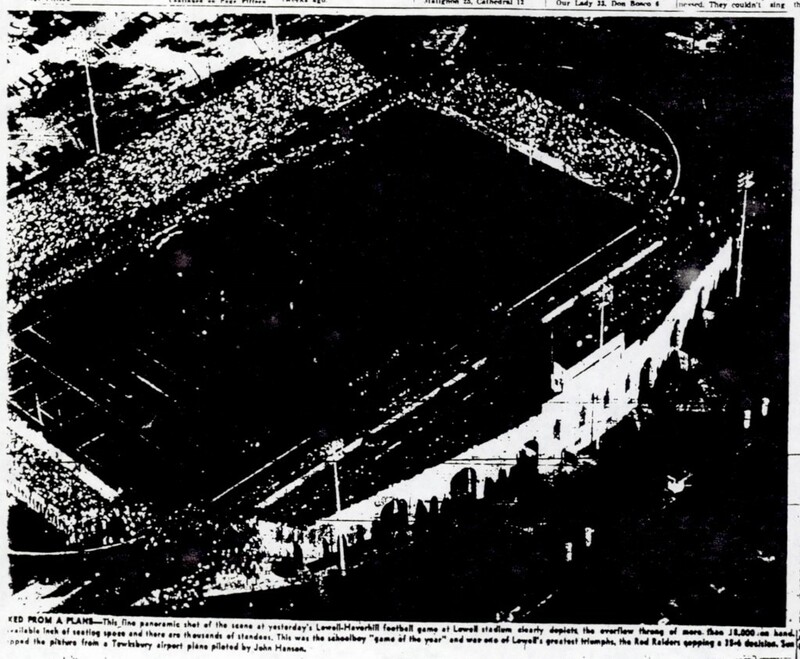 You see the high light standards, the big stands on the home side and the big trees encasing the whole stadium. I don’t get the same feeling going to any other field. And I think even the visitors get that feeling. 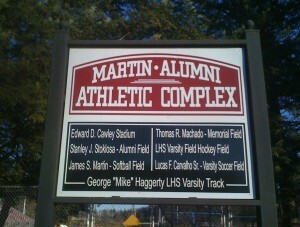 Cawley Stadium is also home to the Mike Haggerty Memorial Track. 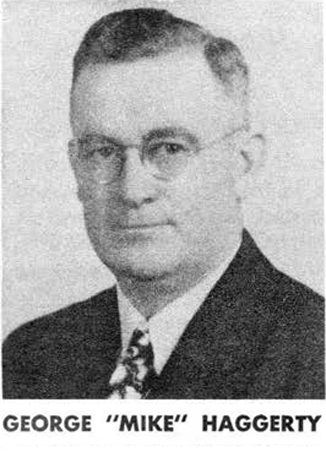 More than a few Lowell High track athletes in recent years have gathered around the engraved stone honoring Haggerty, Lowell High’s legendary track coach from 1918-63, and gotten the mistaken impression that Haggerty is buried there.”Sometimes we’ll spend a little time up there with coach Haggerty to get some good emotion going,” says DeProfio. “Two meets in particular I can think of one against Haverhill and one against Andover – we won when we probably had no business winning. 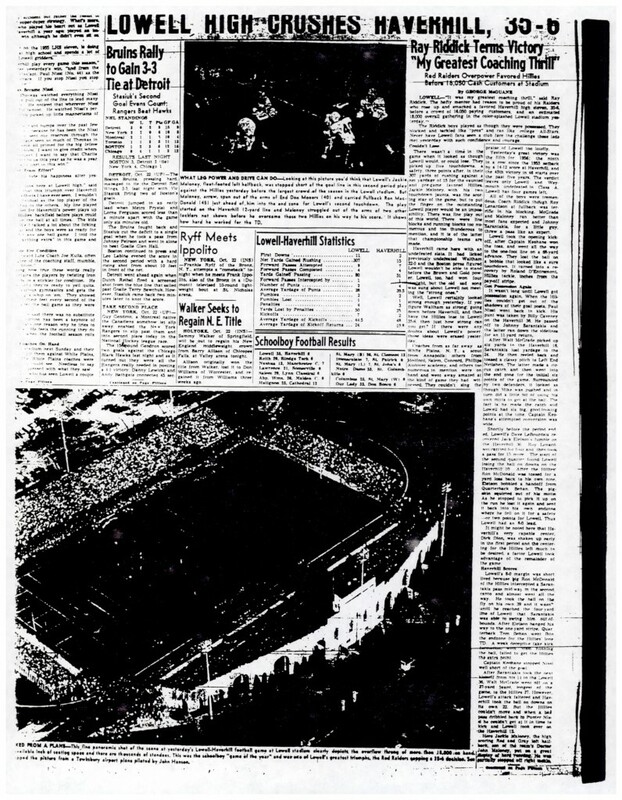 We won after gathering the kids around Coach Haggerty.”A major renovation of the six-lane track was completed not long after the stadium was rededicated in October 1997. The Haggerty Track is now one of the finest outdoor facilities in the state. 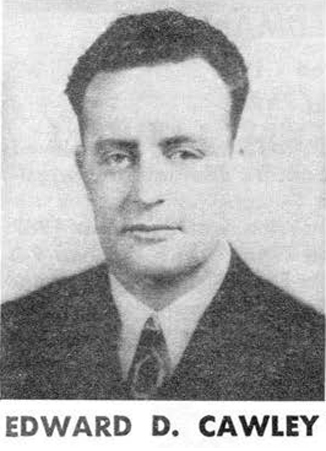 The EMass. Division 1 championships were held here for the first time on May 29. The track has come a long way from the old cinder surface that was painstakingly rolled and lined by former groundskeepers Red Dwyer and Hank Rourke.”It was hard work because they didn’t have one of those fancy things that would put in six lanes all at once,” says Lowell High cross-country and track coach Phil Maia, a former LHS distance runner, smiling with a stopwatch in hand by the modern rubberized track. “They had to go around the track one line at a time. I remember one time I was running and the third and fourth lanes somehow became one in the back turn. I told coach (John) Lang we might have a problem. 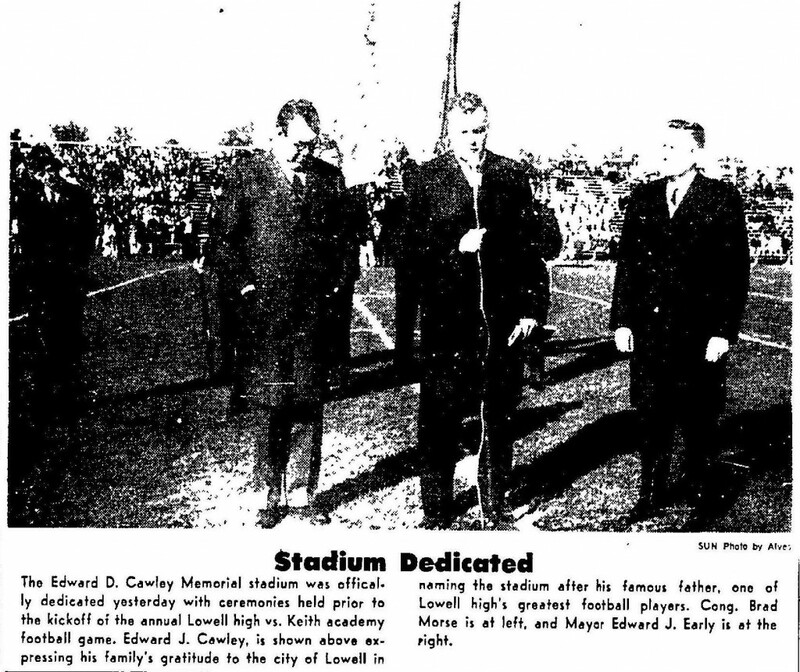 What is now Cawley Stadium was called Merrill Field when it opened on Oct. 24, 1941 with Lowell losing a football game 6-0 to Peabody. Herbert A. Merrill had sold a portion of the land for the stadium to the Lowell High Alumni Association.Merrill had nothing to do with Lowell High sports, a fact that so outraged the late Sun sportswriter George McGuane and others that the field soon became known as Lowell Memorial Stadium.On Oct. 30, 1966, the stadium was renamed Edward D. Cawley Stadium in honor of one of Lowell High’s all-time greatest athletes, whose family also donated to the LHS Alumni Association a portion of the land upon which the Martin facility sits.Maia, current president of the LHS Alumni Association, says donated land has been deeded to the city under certain conditions; among them being that Lowell High has first dibs on the fields. (c) 2004 The Sun (Lowell, MA). All rights reserved. Reproduced with the permission of Media NewsGroup, Inc. by NewsBank, Inc.